In 2007, according to an article in today’s NYT, operatives of Blackwater Worldwide (a company providing civilian contractors employed by the U.S. government during the Iraq War) perpetrated a mass shooting of Iraqi civilians at Nisour Square, killing 17. The article recounts some of the details of the massacre. If you look at the facts that the NYT reports, you can see that the State Department conducted a cover-up of these murders whether if they are implicated in the court proceedings or not. But the main gist of the story is the bumbling of the case against the involved contractors. It’s just amazing how wrong things have gone when such an important precedent could have been made, namely, if you are not officially a member of the U.S. military, but you are employed to act as one, you cannot act with impunity. 51 dead and over 200 wounded by wave of car bombs. 31 dead in outbreak of violence. 30 dead and 70 wounded by car bombs. Series of bombs kill 34. 15 killed by suicide bomber. This is also not counting the legacy of depleted uranium used by U.S. forces in Iraq which is causing huge increases in birth defects in cities such as Najaf and Fallujah where very heavy fighting occurred. 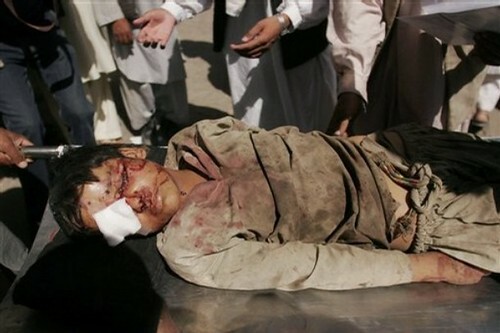 The report said that Afghan civilian casualties are rising, noting an increase of 23 percent in the first half of 2013…According to the report, between January and June of this year, 1,319 civilians were killed, while 2,533 more were injured. Women and children casualties are also on the rise, increasing by 61 and 30 percent, respectively. It’s not impossible for these countries to make miraculous turnarounds and be thriving democracies with strong economies one day. But that day is not in the foreseeable future and it would appear the U.S. occupations of both may have set that day back much further as the level of violence grows in each. Which now begs the question: should the U.S. occupation of Afghanistan be considered a failure equal to that of Iraq? As the United States mulls its decision on when and how to intervene in the Syrian Civil War, we must ask the difficult question of whether a heavy U.S. intervention is good for the long-term prospects of the Syrian people. History would suggest this might seem effective and the right thing to do in the short-term but be a mistake in the more distant future. The problem with any outside influence intervening in a country’s civil conflict is the reality the losing side will assume they lost solely because of that foreign interference. The opposition will continue to push, often violently, until they have regained power and relative internal “peace” begins. The United States has had a very heavy influence in many countries in the post-WWII era so a quick look at some of the results should give us an idea of the long-term success. In 1954, the CIA supported a coup d’état that eventually led to a civil war lasting over three decades. During that time the U.S. supported “government forces and state-sponsored paramilitaries [that] were responsible for over 93 percent of the human rights violations during the war…More than 450 Mayan villages were destroyed and over 1 million people became displaced within Guatemala or refugees. Over 200,000 people, mostly Mayan, lost their lives during the civil war.” Safe to say this was a failure in the long-run for the U.S. and Guatemala would have almost assuredly been better off without our “help”. During the civil war in this country, the United States chose to support the side that was also found guilty of egregious human rights violations. The estimated casualty count: “more than 70,000 people were killed, many in the course of gross violation of their human rights…Despite mostly killing peasants, the Government readily killed any opponent they suspected of sympathy with the guerrillas — clergy (men and women), church lay workers, political activists, journalists, labor unionists (leaders, rank-and-file), medical workers, liberal students and teachers, and human-rights monitors.” And it appears that the side opposed by the U.S. in that war has now taken power in the democratically elected government. Another failure for the U.S. Both of these countries fought part (Laos) or all (Cambodia) of their civil wars during the U.S. invasion of Vietnam. The U.S. became involved in the fighting inside the borders of each while bombing both countries during the Vietnam War. The U.S. supported the eventual losing side in both of these wars and the casualty counts were six figures in each. Ultimately, two more failures for the U.S. The CIA worked to bring about another coup in this country in 1973 which brought notorious human rights violator Pinochet to power. His estimated damage to the citizens of Chile: “1,200–3,200 people were killed, up to 80,000 were interned, and up to 30,000 were tortured by his regime including women and children.” Another black-eye on the U.S. record. Nicaragua’s history contains the familiar story of the United States supporting the losing side in the civil war and that side being in power through elections today. Afghanistan has been a seesaw for the U.S., at best, and will likely be a very violent place in the years to come. And the disaster that was the Iraq War might have been the beginning of even more violence to come at a level some are saying will be worse than Syria. The list seems to continue to grow as the years go by. Which brings us back to the current question of what to do about Syria? We all have our own positions on this but one thing seems clear: it is likely to be a “lose-lose” situation for the U.S. government. If we don’t intervene, a lot of people will die and the world will ask why we did nothing (kind of like how nothing was done to address the recent famine in Somalia that killed 250,000, half of which were children). If we do intervene, it will fuel the fire of the Syrian government forces, even if they are beaten out of power, and they will likely continue with an insurgent movement long after the power in the country has changed hands. This situation is a disaster in every way imaginable and whatever decision the Obama administration comes to on this it will likely be the wrong one when we look back on it in the years to come.